Above is the reason for heading to Parrsboro, NS to visit relatives. On the left is cousin Sandra Dunphy, who lives in town and is very good a genealogy and researching the Mc/MacAloney's of NS. 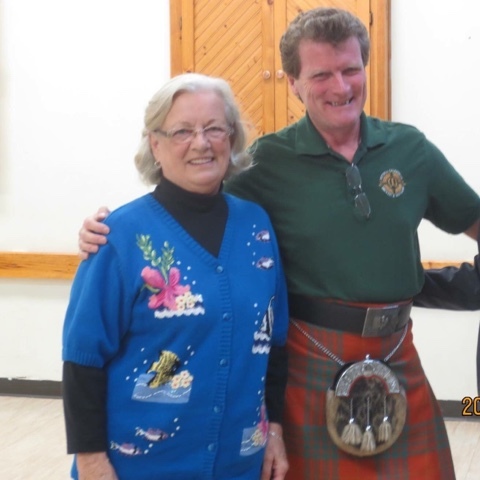 On the right is Graeme MacAloney, who came to Parrsboro to speak to the MacAloney families about his research about the family and its origins in Scotland as part of the Cameron Clan before they moved to Northern Ireland and then on to other parts of the world. Graemen's family moved back to Scotland. It was nice meeting you Graeme and knowing our families are linked genetically from our Y-111 Male Chromosome test. The last time I was in Parrsboro I missed my great, great, great grandfather's grave as it was grown over and not very visible anymore. Above is the top half of the broken stone at Andrew McAloney's grave. Below is the lower half zoomed in to see the dates. He was 62 when he died. His father, Robert McAloney (great, great, great, great, grandfather) who originally migrated from Northern Ireland grave is known. The family were farmers and there is a lake near by called Lake MacAloney. 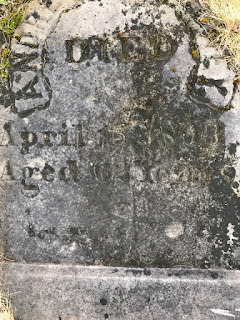 Andrew's son was also named Robert McAloney (great, great, grandfather) and he moved east to Wolfville, NS, where my great grandfather William M. MacAloney (great grandfather) was born. It was William M. MacAloney who migrated with his family to Massachusetts around 1900 and eventually had a dairy farm. What the DNA testing I did along with Graeme is trying to figure out, or prove that other MacAloney, families with same or different spellings are related and then their tie back to the Cameron Clan in Scotland. If you are interested in the Male Y-111 chromosome DNA testing for the MacAloney family please let me know.